Do you notice that our cars seem to drive better after we've washed it? Or how we physically feel better when we wear our favourite pair of jeans? Sometimes the physical objects we adore can affect how we feel, making us better at whatever we're doing. The Leica M Monochrom is exactly that, an emotional catalyst that changes how we feel and can improve our ability to take great pictures. No autofocus, no EVF with live histogram, no colour images, no 1 million dot LCD screen to check for focus? How can this camera possibly help us take better pictures? By its limitations, we are forced to use the M Monochrom as a tool and not a device (more explanation in my full review). We don't depend on technology to take better pictures, we depend on our eyes and our hands... and the camera of course. This is where the Leica is a solid tool, it's dependable, focused, precise. I promise to have my full review up next week, but please enjoy the above picture for now. 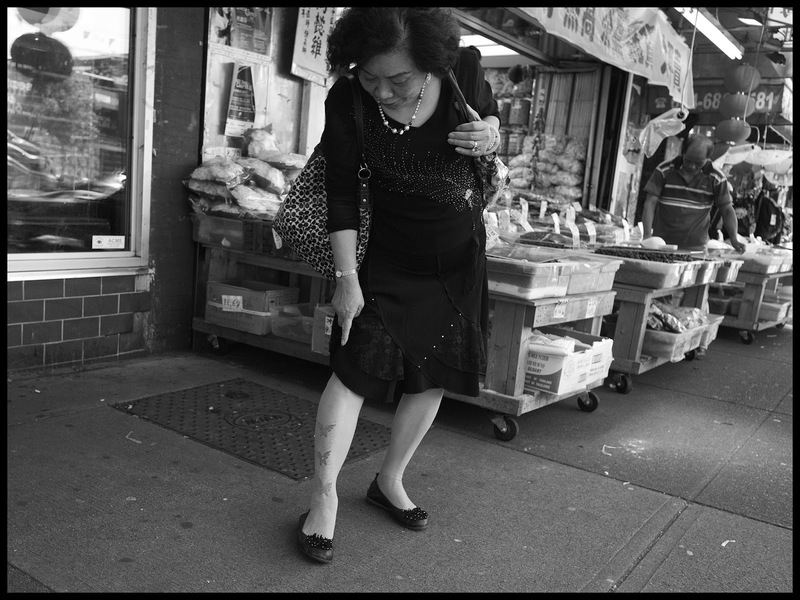 I was walking through Chinatown and this lady just happened to stop and check on her legs (or perhaps her fancy stockings, or is that a tattoo?). As always, I had my camera ready and caught the decisive moment. By zone focusing and having preset the aperture and shutter speed (2 meters, F/5.6, 1/500sec, ISO 1600), I'm not worried about anything else except finding the right moment. I don't have to worry about focus or exposure like most photographers, who depend on their 'device' to make these decisions for them. Try it. It's gratifying to know that we made all the major decisions, and once we take the shot, you don't even need to look to see if we got the image.... we know we did! Happy shooting. Come back often, but next week the full review will be up. Thanks for your patience. Full Review of Leica M Monochrom HERE!